Jared Borland’s style, material and humor is rooted in the alternative comedy scene that is sometimes described as underground urban. However, Jared pulls his inspiration for material from the many different lives he has lived. From the small town Saskatchewan life raised as a strict Mormon to the life changing Hippie ways of living on an island off of an island in B.C. and to his adult city life living in Vancouver where he makes up for his lost time as a Mormon by embracing all the sins a city has to offer. Jared has a blend of self–deprecating humor mixed with observational humor that makes you easily relate to hilarious situations you are too embarrassed to mention yourself. His material and on stage personality is known for it’s adaptability to all audiences and situations. Jared can be crude and twisted or clean and charming, as well as his material has the diversity to be political and topical or just downright perverted or silly. Jared is a rising Comedian who studies the craft as he goes; always watching, learning and growing. He believes you never stop learning, you only quit learning. 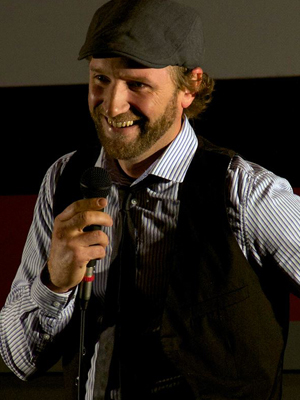 Jared is known for Producing & Starring in his own weekly Comedy Room in Vancouver – “Comedy on the Corner” which is recognized by the city as the best “Open Mic” Comedy Room in Vancouver and arguably the favorite underground room to do in North America. It’s this kind of passion for Comedy that drives Jared Borland to be the best he can be. Catch this rising star while you still can!